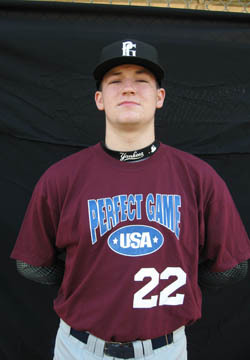 Tyler Campbell is a 2010 RHP/IF/C with a 6'0'', 185 lb. frame from Bel Air, MD who attends Bel Air HS. Solid pitcher's build, has some strength. Slow paced delivery, wraps in back, high 3/4's release with high front side. FB 78-80 mph, mostly straight. Best pitch CB, throws 2 different curveballs, much better shape/spin on 70 mph CB, also has slower 64 mph spinner. Some projection with adjustments.